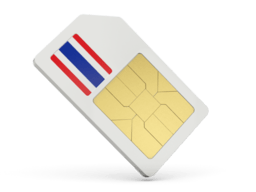 If you intend to use your smartphone or tablet in Thailand, we recommend using a Thai sim card instead of using expensive roaming services with your existing sim card. Call your transfer service, tour company or accommodation provider to confirm reservations and pick-up times. Planning on meeting with friends? It is very common that circumstances, traffic, illness, and change of heart suddenly modifies plans. So if you want to make sure that the agreed time and place is still valid, it is always a good idea to stay in touch. If you go touring alone – without a guide or local resident that is – how do you come from A to B if you don’t know how to pronounce the name of the place you are going and/or don’t know the exact location? In this case, just call a Thai friend or the hotel reception and have them give directions to the driver. I can’t count how many times we have entered a taxi, called a Thai friend, and let him or her explain the route to our destination. Works perfectly! Your family and close friends would love to know that they can contact you if they need to. And if you buy a local sim card with data included, you can keep them updated on your whereabouts and doings. If you travel with friends and get lost from each other or want to go separate ways for a while, you can easily keep in touch and meet up again if you stay connected. Having your smartphone with you, enables you to stay updated on local events, translate words, find vegetarian restaurants in the area, convert currencies, and see your position on the map. Your smartphone is an excellent toolkit, and your Thai sim card can conveniently include the data package to make sure your tool kit is working. In the arrival hall in Bangkok airport, you will find booths of the three biggest mobile network operators, AIS 1-2 Call, DTAC (Happy), and True Move. Do not despair if you forget to buy your sim card in the airport. In all cities, you will be able to find a sim card at your nearest convenience store such as Family Mart and 7-Eleven, although the English skills might be lower here than at the airport. They will generally have all kinds of sim card types available – standard, micro, and nano. Just remember that you mobile phone should not be sim-locked. If you are enjoying a 2 week vacation in Thailand, the most convenient package to buy is the pre-paid tourist sim card packages offered by each of the three mentioned companies. You can get packages with free data for a week and a little credit to call or send text messages. You can see the current deals by following the above links. You can add extra money to your Thai sim card by buying top-up cards which can be found in almost every convenience store. Note that if these sim cards are inactive for one or two months, they will be inactivated. So you have to buy a new sim card with a new Thai number for your next trip to Thailand. Another option is to only buy a basic pre-paid Thai sim card without any attached package. In this case you only pay for what you use. Signing up for a monthly/yearly subscription plan is not ideal unless you plan on staying for several months, which is of course not unlikely if you love tropical beaches. Coming up: Which Thai Mobile Phone Company should you use? Wait around for our analysis of which of the Thai telecommunication companies to use when you travel or live in Thailand.